Beautifully display your framed photographs, literature, and other keepsakes with our Charlemagne Amish Bookcase in a preferred wood and finish. An accompaniment to our classically designed bedroom collection, the Charlemagne Narrow Bookcase can be utilized in nearly any room. The Charlemagne Wooden Bookcase is handcrafted of solid hardwood using mortise and tenon joinery. Soft close slides ensure the drawers of your bookcase extend fully and provide a quiet, controlled closure. Using the options menu, indicate your preferred wood and finish for the Charlemagne Solid Wood Bookcase. 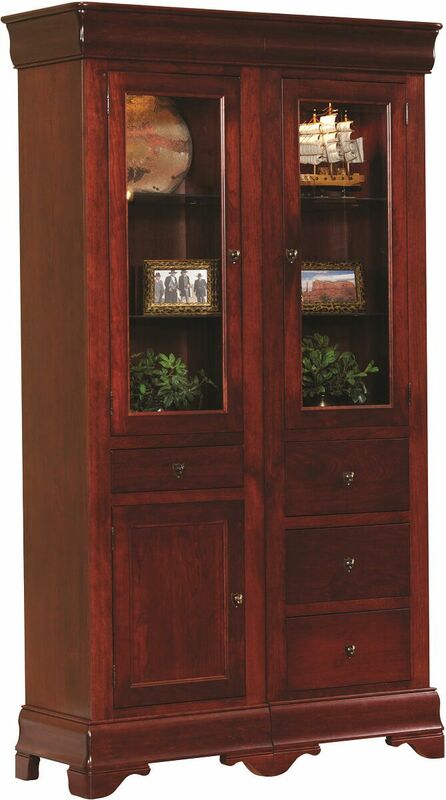 If you wish to obtain the pictured look on your bookcase, choose Cherry with our Mediterranean Fig wood finish.